Should we suggest and you accept a culinary travel-tale through Middle Albania, it is likely that those who are at least a little familiar with that part of Albania would think of the traditional dishes like ‘tava e dheut’, ‘tava e kosit’, all kinds of roasted meat, and other dishes either inherited or influenced from the Ottoman cuisine that presently has gained all of its own characteristics and is called the Middle Albania Cuisine. We, in fact, would introduce this beautiful part of Albania to you in a completely different way – by presenting two ancient cultures in Albania: vine-growing and olive-growing. Our country, as a typical Mediterranean country, is a well provided one for the cultivation of vine and, as the archeological findings show, it is one of the most ancient places of vine-growing. Presently, the enological market in Albania is represented by several successful wine producers like Kallmeti, Arbëri, Kokomani, Belba, Bardha, Herta, Skënderbeu, etc. who are now working together with the native viticulturists, agronomists and enologists to implement their know-how in the Albanian land. Naturally Tuscany has more, but the Middle Albania has a lot too. It presently is the richest area in wineries in Albania that produce a high quality wine well confirmed by the numerous prizes awarded in national and international events. It also has an abundant amount of traditional factories that produce extra virgin olive oil. We are about to show you the best of this agro-tourist industry that entered the list of tourist itineraries right away. We’ll start our tour in Farkë e Madhe, Tirana, at Shehi family Winery. Wine producing is a tradition in Shehi family, well preserved by the five Shehi brothers who have re-built a modern and traditional, at the same time, winery that occupies a big area. The winery is located in the middle of a land planted of different grape varieties, of olive trees and other fruit trees. It consists of a traditionally furnished spacious area with the guests room sided by settees, the fireplace, etc. and a children play ground that can welcome many visitors. Shehi Family Winery offers wine tasting and traditional products. On Tirana surroundings, where a pleasant hilly relief stretches out adjoining the capital like a crown, several qualitative wineries are situated. One of them, Lundra Winery that is created in the 1992, is located next to a 60 hectars vineyard and all the vinification, bottling and packing processes are performed, in a closed cycle, in the same place finishing with the product taken to the market. The Winery is open for a tour to any country and foreign tourists who can see the entire vinification process. The most suitable period of the year to visit the vineyard is between September and October when the visitors may attend the grape harvesting. Wine tasting in the Winery is also offered. Lundra is a well known village for its vineries and vine-growing natural elements. Its inhabitants have always grown vines and produced wine in the traditional way. Now, one of those wine-making places is “Nari Lundra” Winery that has started to operate since 1992. The grape they use for the production of their white and red wines and also for their raki, is from the famous Lundra vineyards. Their wine and raki are exclusively produced for Nari Lundra restaurant. The vinery, where the grape harvesting can be attended, and the winery, where the wine-making process can be looked at, are tourist destinations. But, should you wish, accompanied by a guide, to expand your visit to the surrounding area, you may want to visit Petrela Castle, the ancient Illyrian town of Persqop, Pëllumbasi cave, Cyclopes’ eye, etc. Now we’ll descend Lundra hills and continue our tour on the North of the capital where Enol Winery welcomes the tourists as a visiting destination throughout the year. Situated in the middle of fertile hills and surrounded by vineries and olive groves, Enol Winery offers not only wine tasting but also traditional food in a restaurant located above the Winery. With a variety of products, Enol is a suitable setting for all ages. Vora area, where Vila Shehi is located, has a vine-growing suitable climate as well. Vila Shehi offers high quality products that are made of the grape from the surrounding vinery. Vila Shehi’s Winery is visitable throughout the year offering tours of the Winery Museum and wine tasting room where the house wine and the local wine of the surroundings can be tasted. The grape vine varieties cultivated there and that date back to the 1967, are: Shesh i Bardhë, Shesh i Zi, and Merlot. Produced in a traditional way that is enriched by the science and the art of wine-making, the wine is ‘grown old’ in large oak barrels and then taken through laboratory tests and tasting sessions by specialists. Some of the Vila Shehi products are: Shesh i Bardhë wine, Shesh i Zi wine, Merlot wine, Cabernet Sauvignon wine, Rose wine, Muscat raki, Grape raki, etc. The well-known Bardha family, originating from Leskoviku (Albania) and with a deep-rooted tradition in vine-growing, would undoubtedly be part of our tour as they have established a quality Winery in Marikaj. Located on a soft hilly relief and surrounded by vinery and olive-groves hills, Bardha Winery, in addition to offering a gorgeous landscape, is distinguished for its high quality products. Among its most popular wines are: Merlot wine, Shesh i Bardhë, Cabernet Cuvee made of Cabernet, Leskoviku Merlot and Shesh i Zi grapes. To add to the delight of quality wine tasting in this area of Tirana the pleasure of cultural sites, here’s our advice to pay a visit to Preza Castle, a medieval castle where apart from touching the history you will enjoy the spectacular views of Tirana and Kruja. 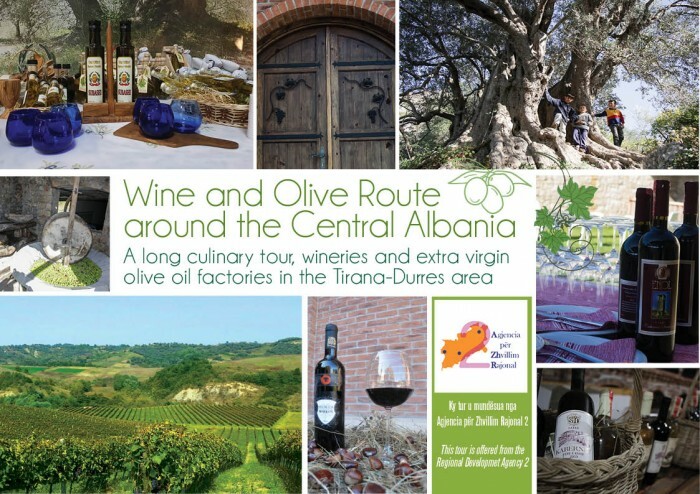 Leaving Tirana behind, we enter Durrësi area where a number of wineries have either prospered or are on the way of developing not only their products but also of their establishments. Such is Herta Winery. You can find there high quality wine like Merlot, Cabernet Sauvignon, white wine made of Sheshi i Bardhe grape variety, of the biological Merlot DYrrahu variety, etc. 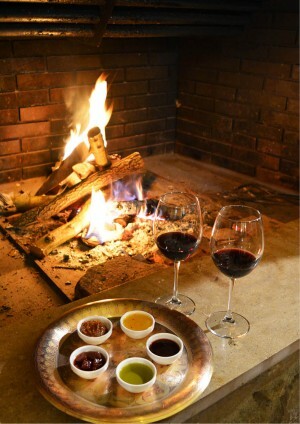 Wine tasting is offered in the winery along with local and traditional products. A visitable destination as well is the vinery that stretches out next to Herta Winery. Enisa Winery is a destination worth of visiting during the fruit harvesting period, particularly in August, September and October and when the wine and raki are produced, from August till November. Enisa Winery, in addition to wine tasting, offers for the visitors tours of the vinery surrounding the Winery, of the fruit trees and nut trees fields, and of its olive-grove. Duka Winery, a true tourist destination where the vineyard, wine-making unit and the wine cellar are worth visiting. There you can also see the Topani Lake and stop at the restaurant by the Lake to taste the wine and enjoy the traditional food. “Gjergj Kastrioti Skënderbeu” Alcoholic Drinks Manufactory is the biggest of this kind in Albania. It is positioned on Rrashbulli Hill and occupies an area of about 45,000 square meters. Originating from 1933, it was established by an Italian family in Sukth that started by a simple grape processing using modest capacities. In 1957, the construction of Winery on Rrashbulli Hill started. A new area began for the manufactory in 1960 when the first three new buildings that increased the factory capacities finished. The voluminous construction work continued until 1987 transforming the manufactory into the biggest factory of that kind in the country. The products of this manufactory are esteemed several times with prizes in national and international competitions. In 2001, the manufactory was privatized. Privatization gave vigor to its further development. Presently, they own about 40 hectars of vinery on Arapaj Hills. The grape produced from these vineyards is used as the raw material for the production of white and red wines. “Skënderbeu” Alcoholic Drinks Manufactory produces about 13 kinds of wines and other alcoholic drinks, like Skënderbeu Brandy, Bato Brandy, Muscat Raki, Grape Raki, Fernet, Orange punch, Primitivo nectar, different liquors, white and red vinegar, and balsamic vinegar. Last but not least of the Durrësi tour, we are not overstating if we say that Kokomani Winery is the most beautiful of them and is located in the most favorable place to enjoy all, the impressive panorama, the beauty of a Tuscan-like winery, the taste of special wines and the restaurant added recently to enrich the wine tasting experience. Kokomani Winery is located on the hilly area of the Central Albania, in Eminas i Vogël Village, next to Shesh Village, where the well-known Shesh variety of grape originates from. This autochthonous variety comes in two types: Shesh i Bardhë and Shesh i Zi, which are popular for the production of a quality wine very specific for its flavor and taste. The founders of this winery have enriched the ancient tradition of vine-growing and wine-making in this area with their 15 years of experience in Tuscany, Italy, at the most prestigious wineries of that region. Kokomani Winery produces three types of high quality wines either in consistence and image. Shesh i Bardhe, Shesh i Zi, and Shën Mhill, the latter an international classic wine made by mixing the three well-known Bordeaux varieties: Cabernet Sauvignon, Petit Verdo and Merlot. Our wine tour will come to an end in a special and very famous winery in Kavaja. In addition to the high quality products, Belba Winery is known for the modern equipment and technology it uses to process the selected grapes into wine. Grape varieties are selected based on the land type where the vines will grow. The area is ideal for the cultivation of Sheshi i Zi, Sheshi i Bardhë, Chardonnay, Prugniolo Gentile, Trebbiano, Toscana, Merlot, Cabernet, etc. varieties. Founders of this winery, the Belba brothers, worked and were specialized in vinery cultivation and grape processing for a period of 11 years in Italy, in La Casella Winery in Montepulciano, province of Siena, Tuscany. After this experience, they returned to Albania, to their homeland, where they established Belba Winery. The vineries, of which grape Belba wine is made of, are located in Golemas Village. The most popular products of Belba Winery are: Kavaljon Reserve Wine made of Progiolo Gentile and Montepulciano grape, Chardonnay Kavaljon Wine made of Chardonnay grape, Kavaljon red wine made of Sangiovese, Montepulciano and Merlot grape, Shesh i Bardhe Kavaljon Wine made of Shesh i Bardhe grape, Shesh i Zi Kavaljon Wine made of Shesh i Zi grape, etc. Rich in olive trees, some of them hundreds and a few some thousands years old, Albania has a Mediterranean relief suitable for the production of quality olive oil. Numerous hills planted of olive trees offer good opportunities for the development of an oil producing industry. Presently, operating both in the native and in the foreign markets, several small olive oil factories are known. They produce extra virgin olive oil that is certified and has the parameters of a bio product, like not many in Albania. A visit to these factories will give you the opportunity to see closely those rare exemplars, the 3-4 thousand years old olive trees that may be the only ones in the entire Mediterranean basin. IVAP Company operates in the collection, processing and trade of olives and olive oil and its by products, wholesale and retail. One can take a tour of the IVAP olive oil establishment at any time, but the most interesting time is when the olive oil is processed. The visitors will have the opportunity to taste different types of olive oil made of different olive varieties that are collected in different areas. The biological extra virgin olive oil of IVAP Company is awarded with international prizes. Located in the center of Marikaj, Subashi factory uses the cold and continuous oil extracting system. Subashi Olive Oil Factory has participated in different competitions and has won several prizes. Marikaj’s hills, of which olives this factory is furnished from, are rich in olives whose age varies from 15 years, 60-70 years, 400-500 years and 800 years old to a couple of thousand years old for a few of them. In this olive grove you can find all kinds of flora and fauna of the area like the edible plants and flowers, aroma plants, different spices, etc. In the surrounding area you can take a tour to the old church near Kuçi, to Marikaj Lake, to the Oil Mill and shop, etc. Subashi Oil Factory offers about 35 products made of plants from its olive grove. They can be tasted in the factory premises accompanied by other local products. Shkalla Olive Oil Factory is located in Lundër. It is a family business that started 100 years ago when in Ramazan Shkalla’s family oil mill the olives of Farkë Village were milled. You can take a tour of the establishment at any time, but the most interesting period is the olive oil processing between October and December. Because the olives are collected in different areas, you can taste different types of olive oil. Shkalla olive oil is esteemed with international prizes as a biological extra virgin olive oil. “Tre Miqtë” Oil Factory in Ndroq maintains European standards of oil producing. They process light green and dark green olive varieties. The factory is open to native and foreign tourist to take a tour of its premises and see the olive oil processing and the 250 years old olive oil mill. The products of this factory have been demonstrated in national and international fairs and honored with appreciation and quality certificates. In addition to the establishment tour, the visitors may enjoy the traditional food in the restaurant nearby or in the open field under the 500 years old olive trees.